MLM Lifts and Mfg. is active in many markets and making special products for the agricultural market is one challenge the company truly enjoys. With welding capabilities that include both stainless steel and carbon steel, MLM is called upon frequently to help with special feed trough needs and products such as auger case covers and housings. MLM will also assist independent farm operations with specialized needs and structural welding repair. 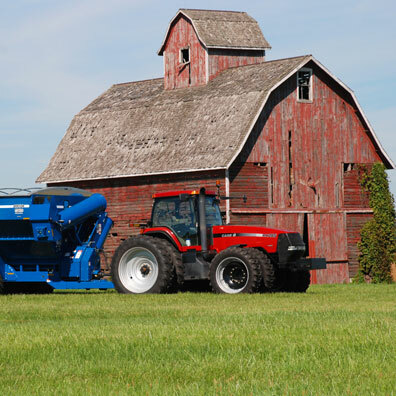 One product our engineers have their eye on is the development of a specialized hydraulic lifting system for heavy agricultural equipment dealers. There have been a number of calls for this type of equipment from dealers across the country and the design concept is on the board pending finalization. This product will be supplied directly to Ag Equipment dealers and large farming operations. If you have any special lifting requests for the agricultural industry, do not hesitate to contact MLM for help. MLM can also produce specialized skid steer attachments for unique material handling applications encountered in the farming process. When an agricultural application calls a different or more innovative tool or product solution to get a job done, MLM enjoys these types of challenging opportunities. Please call us with any special or custom needs you may encounter.